While many of US President-elect Donald Trump’s opponents vowed to boycott his inauguration on Friday, across the Atlantic, opponents of tiny Gambia’s recalcitrant President Yahya Jammeh were mobilising to express their opposition more forcefully, by physically ousting him from office if he did not hand over power. Senegalese troops and Nigerian aircraft have massed on the border as Jammeh’s mandate expired, and a Nigerian gunboat entered Gambian waters, ready to remove Jammeh from office and install Adama Barrow, who beat him in the 1 December elections. But would they actually do so? Or was it just a bluff? 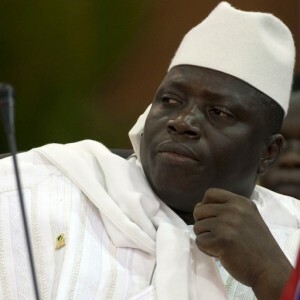 And, if so, would Jammeh buckle under pressure – or would he call their bluff? A major test loomed for the West African intergovernmental body ECOWAS (the Economic Community of West African States), which put its credibility on the line by resolving to use military force, if necessary, to enforce its democratic norms. It’s also another big credibility test for the African Union (AU), which has backed ECOWAS’ decision to use force if necessary to topple Jammeh. After 22 years of often brutal years in power, Jammeh conceded electoral defeat on 3 December. But then a week later he reneged, claiming election irregularities, and challenged the results in court. He has also rebuffed efforts of a delegation of ECOWAS leaders, led by Nigerian President Muhammadu Buhari, who visited him in Banjul to try to persuade him to step down peacefully. Offers by countries like Morocco and Mauritania of asylum have so far also fallen on deaf ears. Maurice Toupane, a researcher at the Institute for Security Studies (ISS) in Dakar, believes this is mainly because of pressure not to give up from Jammeh’s fearful entourage. It was apparently threats – tactically disastrous, one might add – by Barrow’s aides, shortly after his election victory, to prosecute Jammeh and others in his government for human rights violations, which probably prompted Jammeh to reverse his concession of defeat on 9 December. Asylum or amnesty for him would still leave his lieutenants exposed. This week Jammeh’s court challenge foundered as the head of the Gambian Supreme Court, Emmanuel Fagbenle, ‘recused’ himself from hearing Jammeh’s challenge to the election results. The court currently has no other judges to hear the case. Then Jammeh declared a state of emergency to block any transfer of power. But Barrow, speaking from what he hoped would be a very brief exile in Senegal, insisted this week that he would return to Gambia to duly swear his oath of office and take up his presidential duties regardless. This set the stage for major confrontation. If Jammeh does not blink first, will ECOWAS indeed invade Gambia? Toupane thought it might eventually do so, but only as an absolute last resort. And ECOWAS would meanwhile continue to try all available peaceful measures, including targeted economic and diplomatic sanctions against Jammeh and his entourage, to try to persuade him to stand down. As Toupane noted, in an ISS briefing on Wednesday, four of Jammeh’s cabinet ministers as well as several ambassadors, have already resigned over his failure to surrender power. ECOWAS hopes targeted sanctions will provoke further defections and ultimately bring down Jammeh’s government without a shot being fired. And ECOWAS and the AU would also continue to isolate Jammeh’s administration diplomatically. Both have already vowed to withdraw recognition from Gambia if Jammeh did not stand down when his mandate expires. Toupane has also indicated that they might go further, formally inaugurating Barrow as president in the Gambian embassy in Dakar today, rather than in Banjul. Some commentators have suggested that a military intervention would be relatively easy. Except for a short coast, Gambia is entirely surrounded by Senegal, the launchpad for an ECOWAS force. Gambia’s army is very small and its commander has been quoted as saying he will not fight the Senegalese. But Toupane believes a military intervention should not be taken lightly. After five coup attempts against him, Jammeh has toughened the military. A firefight, if there were one, would have unpredictable humanitarian and socio-economic consequences for the local population. ECOWAS has shown a greater readiness than other regional economic communities to use military force to enforce the democratic norms that the AU and its subsidiary bodies espouse. These are founded upon a firm opposition in the AU Constitutive Act to ‘unconstitutional changes of government.’ This has been clearly interpreted to include not only toppling a duly elected government by military coup, but also failure to give up power when defeated in a democratic election. In a not-dissimilar case in 2011, ECOWAS formally backed the use of military force to topple former Ivorian president Laurent Gbagbo when he refused to concede his defeat by Alassane Ouattara in the elections of December 2010. In the event ECOWAS forces were not needed, as United Nations (UN) and French troops did the job. If anything, ECOWAS’ resolve to remove entrenched incumbents may be greater today than it was then. Ouattara is now the Ivorian president, and thereby a member of ECOWAS’ supreme leadership. And, as Peter Penar of Michigan State University has pointed out, there is a growing body of former opposition leaders in ECOWAS, including also Buhari, Liberia’s Ellen Johnson Sirleaf and Senegal’s Macky Sall. By contrast, other regional economic communities, such as the East African Community and the Southern African Development Community, more dominated as they are by incumbent leaders or parties, have been much less willing to tackle presidents who cling to power in their member states such as Burundi and Zimbabwe respectively. On Wednesday, Senegal sought UN Security Council support – though reportedly not explicit authorisation – for an ECOWAS military intervention in Gambia. Whatever happens over the next few days, Gambia seems to be shaping up as the inevitable crisis du jour that will dominate discussions at the annual AU summit in Addis Ababa next week. And a test case for Africa’s determination to enforce democracy.